Comedians in Cars season 8 episode rankings: All hail Lorne Michaels, right? For a show with only a few changing variables, Comedians in Cars Getting Coffee continues to stay fresh with a different guest each week. Give Jerry Seinfeld credit, his hosting style enables comedians to be themselves, with varying personalities and opinions. This leads to episodes that focus on completely different topics but still maintain a high entertainment value. That premise was never truer than in season eight, where the top two episodes have almost no overlap. Overall, this season had five strong episodes and one disappointment, highlighted by what I consider one of the best episodes in series history. The late Garry Shandling was discussed a lot during this episode. Both Apatow and Seinfeld reminisced about the influence he had on their lives and careers. But tons of background noise, dropping the Escape from Syosset! theme after the introduction and nothing truly memorable in the episode made this a disappointment. That said, I am all in favor of Judd Apatow’s diet. This episode wasn’t bad… it was good. A notch below great, but still definitely worth watching. Oliver told great stories about his wife, a stand-up gig in an emptying room, and eating a lot of key lime pie in a hotel room. Some of the other bits were funny to Seinfeld and Oliver, but they didn’t translate well within the episode. It’s fascinating that Oliver comments so much on American politics that he’s practically not British anymore. I am a Smoove fan, but whenever I’ve watched him on TV, he’s a ball of energy, constantly dancing and moving around at 90 miles per hour. He didn’t do that on the episode. Smoove reflected on both his early life and how much stock he puts in his performances. It’s fascinating to hear about his post-show routine after a bad performance. My only issue was the abrupt ending, which is less of a complaint and more of a wish. 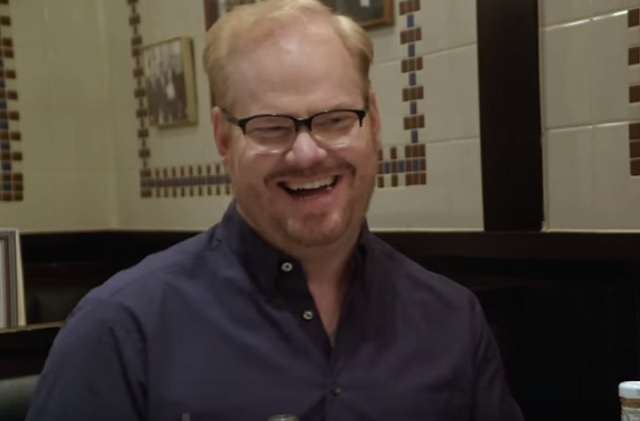 Gaffigan is a true everyman, talking about burgers and entering a trance-like state while eating at the 2nd Avenue Deli. As the debut episode of the season, there was a slick new graphics package introduced. Gaffigan and Seinfeld shared some similarities, but looked at issues from different perspectives. This was most noticeable during the religious bits, which were pretty funny. Not to mention, the car looked ugly, even if it was an old “Mystery Machine”-style van. There was so little laughing, but still so much engaging content. Cho was honest and candid about a lot of difficult times in her life. Being able to share those stories is extremely meaningful. Because of Cho, a comedy show made me run the gamut of emotions. Even if there aren’t many memorable quotes, the topics themselves make this episode worth watching. It might make you feel a bit uncomfortable, but in a way that will help you learn. The Saturday Night Live creator is true television royalty, and he shows off his own comedic chops during the episode. It was smart to have the duo walk to Michaels’ office, almost like “a day in the life.” I was enthralled from beginning to end during this perfect episode. And, no offense, it wasn’t all due to Lorne. The photography was especially well done, especially with a dark restaurant and the busy streets of New York. In the age of social media, we are usually too quick to anoint “perfection” or “the best/worst ever” of something. Weeks later, this episode is still so fresh in my mind because of how great it really is. I could keep going on Michaels, but there’s a full review of that one already. This season was the best one that I’ve reviewed for The AP Party in both quantity and quality. Scrolling back up to see John Oliver as the second-worst episode of the season makes me shake my head because it wasn’t bad! It was actually pretty good and I’ll likely watch it again. The only “downside” is that season nine has an even higher standard to live up to.